Tom Brokaw image via Wikimedia Commmons. 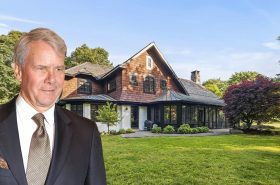 Newscaster/household name Tom Brokaw has listed the 56-acre estate in Pound Ridge, NY that he and his wife, Meredith Auld, have owned for nearly 20 years, The Real Deal reports. The listing, asking $6.3 million, appeared on Tuesday according to property records. The family compound includes a 4,000-square-foot main house, a pool house and a caretaker’s cottage, all on a private five-acre lake.